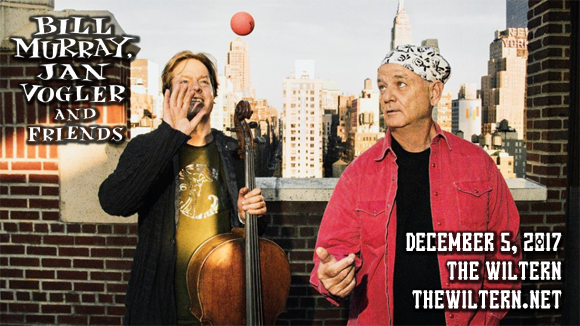 Eccentric actor and comedy icon Bill Murray is playing his newest role in his first ever musical tour, coming to The Wiltern on Tuesday 5th December 2017! In support of his debut album New Worlds, Murray will be joined by cellist and album collaborator Jan Vogler for a night of music, poetry and enthralling entertainment! Book now to avoid disappointment – tickets are going fast! American actor, comedian, writer and singer Bill Murray first rose to popularity in the mid-late '70s on Saturday Night Live, earning is first Emmy Award for his work on the show. Murray starred in a host of comedy films throughout the '80s and '90s, including: Caddyshack (1980), Stripes (1981), Tootsie (1982), Ghostbusters (1984), Scrooged (1988), Ghostbusters II (1989), What About Bob? (1991), and Groundhog Day (1993). In 2003, Murray starred in Lost In Translation, which earned him a Golden Globe and a BAFTA Award for Best Actor, as well as an Academy Award nomination for Best Actor. His debut album, New Worlds, was released in 2017.